TIP Development works with a Team of Professional Skilled Craftsman that specialize in their own fields of expertise. For over 10 Years we have teamed together to bring One Stop Construction Services to our clients. TIP Development Sells & Constructs Both Modular Homes & Log Homes including: Excavation Work of any type. Construction and Building of Log Homes, Modular Log Homes, Log Homes, Timber Frame Homes, Stick Built Homes and Modular Homes. No project to small or to big to meet your budget. * Total Turnkey Contracting and coordination/overseeing of entire project from start to finish. Total Hands on coordination of the construction and scheduling the Contractors on site on a daily basis. * TIP works very closely with the owners on a daily/weekly basis keeping them informed of the progress. Each week the owners will receive a emailed Progress Report with photos attached of the project and work as it is done. Also a detailed report of their budget/expenses backed up with receipts and certificates of completion from each Contractor as work is completed. * TIP provides each client with a Construction schedule & payment schedule. 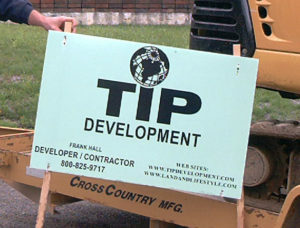 TIP Development provides Land Development Services and Sales of Land & Homes. TIP Management provides Management Services for Rental Homes, Condos, Offices and Land Parcels. Includes: Rental Marketing & Advertising, Maintenance and Management, Lawn Mowing, landscaping, Snow Plowing, Tree Removal and Winter Maintenance. * Perc Testing & Septic/Lot Designs. * Clearing of wooded lots. * Foundation & Patio Construction. * Complete Rough & Finish/ Fixtures Electrical Work. * Complete rough & Finish Plumbing work. * Sanding, sealing & tile work. * Install of shingles or tile.